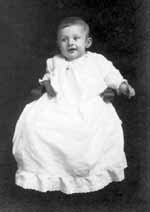 Meta Goering was born on January 16, 1916, in a farm house in southern McPherson county, Kansas. She was the first child of Jonathan (Jonas) J. and Katherine (Katie) Zerger Goering. (Community map showing location of Jonas Goering farm) Katie kept a record book with a large page for Meta and each of her eleven brothers and sisters--from birth to marriage. From this record we know vital information: Meta held her head up at three months; crawled at eight months; walked at a week less than eleven months; spoke words at sixteen months; learned the capital letters of the alphabet from her toy blocks by four years; had the whooping cough at age five and chicken pox at age six; and stayed at home at seven years and five months while her parents went to church to hear Jacob Quiring, a Mennonite evangelist. Age eight was a special time of achievement: Meta began milking cows, taking music lessons, and, on August 18, 1925, had her tonsils removed at Halstead by the famous "horse and buggy doctor," Dr. Arthur E. Hertzler. Meta grew up in a thriving Mennonite community of large families. Her father was one of seven children of Jacob J. and Anna Schrag Goering. Her mother was one of eleven children of Joshua and Freni Stucky Zerger. The Goerings and Zergers were prolific. 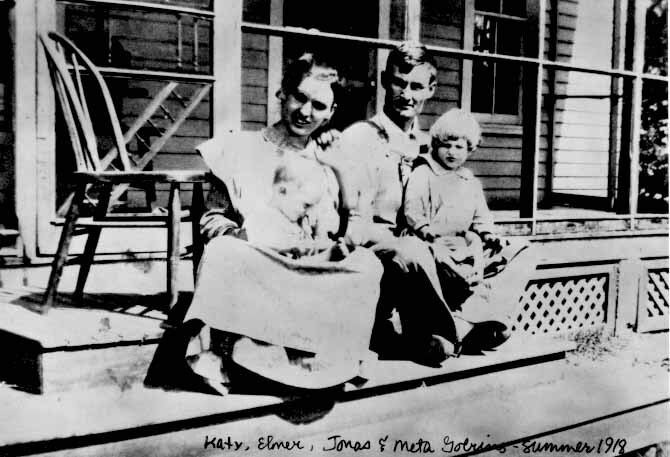 By the time she entered Pioneer Grade School in 1922, Meta had sixty-nine first cousins. Eventually she had a total of 105 first cousins, seven of whom were double-cousins. Her Uncle Jake and Aunt Lydia were siblings of Meta's father and mother. Meta's grandfather, Jacob J. Goering, had died in 1911, three years before Jonas was married. 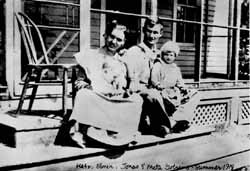 In 1914 Jonas and Katie moved into the Goering home place. 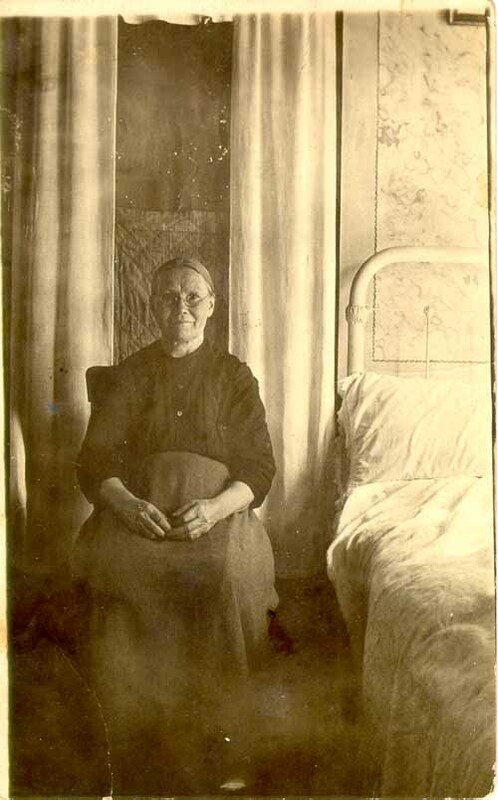 Jonas' mother, Anna, for a time stayed with her other sons, but eventually returned to live with Jonas and Katie--for the next thirty-six years. The farm was located in Mound township, a mile and half north and a half mile east of the Hoffnunsfeld-Eden church which was the center of the Mennonite settlement. Three of Jonas's brothers--Christian, Henry, and Jacob--also started farm families nearby. The Goering brothers had farm equipment in common--wheat threshing rig, manure spreader, and others. They also shared farm labor, Sunday visits, and larger family celebrations. It was a somewhat more closely knit extended family than that of Ernest Juhnke and his siblings. The Jonas Goering farmstead hosted more of the celebrations because that was where Grandma Anna lived. Every year on Grandma's birthday, January 28, all her children and grandchildren arrived to celebrate. The menu was the same every time--bologna, cheese, crackers, and ice cream from town. Aunt Freni was acclaimed for her angel food cake. But Jonas and Katie also made a point of staying in touch with their other brothers and sisters as well, which in most cases meant Sunday visits at least once a year. Meta especially enjoyed going to Uncle Chris and Aunt Adina's place, because their daughter Anna was just Meta's age. "I always had companions wherever I went," remembered Meta. On one occasion when Meta was still quite small, she was visiting at her Uncle Jake and Aunt Lydia's place a half mile to the west when a visiting farmer was badly hurt in an machinery accident. Meta watched wide-eyed as people scurried about until the doctor came and applied the anaesthetic and treatment. At one point the worried little Meta said, "If only the Good Samaritan would come by now!" She had learned in Sunday School that the Good Samaritan knew how to help people who were in trouble. 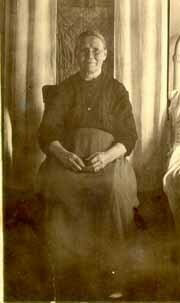 Meta's grandparents were Swiss-background Mennonites who emigrated from Polish Russia (Volhynia) to Kansas in 1874. The immigrant consciousness of the community was strong. When Meta was a senior at Moundridge High School, she wrote a short autobiography ("Copyright 1931. All rights reserved.") . Her first chapter was "How My Forefathers Came to America." The migration was triggered, Meta reported, by loss of religious freedom. The Mennonites opposed military service and decided to go to America rather than compromise their religious beliefs. In Kansas they "worked hard and saved money so that they were soon comfortably well-to-do and respected people." Meta had daily contact with the immigrant generation through her grandmother, Anna Schrag Goering. Anna had been a young married woman, age nineteen, at the time of migration. She could not speak English, so the Jonas and Katie Goering family spoke German at home--actually a "Swiss Volhynian" German dialect. 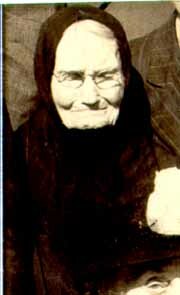 Grandma Anna was a rich source of folk wisdom--sayings and proverbs, medical remedies, and knowledge about plants. She was a midwife, present at the birth of some of Meta's cousins. Once when Meta had a wart on the palm of her hand, Grandma tied a string around it and said a Sprichwort (a saying, probably in Russian, which Meta couldn't understand), and then buried the string in the yard in front of the barn. The wart was gone in a couple of weeks. Grandma and Meta went out to see if they could dig up the string but they couldn't find it. "See," said Grandma, "it has rotted." When skin sores got infected, Grandma applied a paste of crushed and cooked flaxseed. When Meta stepped on a nail, Grandma burned sulphur and sugar to smoke the injury. Meta learned German sayings from Grandma, seemingly a proverb for every situation of the day. When Grandma swept the room and someone was in the way, she said, "Was mehr ist wie Dreck, geht von selber weg," ("What is more than dirt will go away by itself."). When she was dishing out pieces of pie, and someone in the large family complained that the portions were too small, she would say, "Was das Klena nicht ehrt, ist das Grosse nicht wert," ("Who does not honor the little is not worthy of a big piece."). If someone didn't get work done until the evening, she said, "Am Abend ist der Faule fleissig," ("In the evening the lazy person gets diligent.") Meta and her siblings all learned habits of hard work from Grandma. Once in Sunday School when the teacher admonished the children, "Obey your mothers and fathers," one of the Goering children spoke up: "And our grandmothers too." She gathered the long branches and put them in the rafters to 'cure.' When the time came to begin she selected certain strong ones for the base and attached long branches to the center extending them upward about three inches apart. After weaving thinner reeds came the time to make the top border and cut it in a sturdy finish. Grandma also remembered old religious customs--such as the "holy kiss." Meta was startled when an old acquaintance of Grandma, a man named Braun from Minnesota, came to the Goering farm and greeted Grandma with a ritual holy kiss. Grandma Anna expressed a fatalism about life that Meta found strange. When an infant would die, Grandma would thank God. Perhaps her attitude reflected the Anabaptist view that unbaptised innocent children are accepted unconditionally by God. Perhaps Grandma Anna's fatalism also reflected the sufferings of her own life. She had been the victim of an abusive father; at age sixteen her parents had forced her into an unwanted marriage; soon after arriving in America she had lost her two-year-old daughter in a measles epidemic; and she had lost to death two sons (Jacob, age 17; Peter, infant), one daughter (Freni, age 27) and two husbands (Christian Schrag, 1878; and Jacob J. Goering, 1911). For decades, she expected to die soon. She wouldn't want a new dress because "es lohnt nicht" (it doesn't pay). She would bring Meta into her room and show her the petunia and four o'clock flower seeds she had carefully preserved on the dresser, and give instructions on how to plant the seeds next spring after she was gone. But Grandma lived until 1947, when she was ninety-two and Meta had been married ten years. Meta's mother, Katie Zerger, had quit school after finishing the seventh grade. She was the ninth of twelve children in the Joshua and Freni Stucky Zerger family. (One had died in infancy.) Her father died in 1910 at age fifty-two, when Katie was fifteen years old. The Zerger family was musically gifted. Katie played the organ accompaniment for special programs in the church. Katie married Jonas Goering in 1914, sixteen days before her twentieth birthday. They did not come together for several days after the wedding. The custom in the Mennonite community was for newlyweds to delay consummating the marriage, and some people gossiped when the delay would be just a few days. But the far greater self-denial of Katie's married life was to share living space and parental authority with her mother-in-law, who had lived in that same house before Katie moved in. But the arrangement worked reasonably well, at least as Meta remembered it. For a very large part of her life, Katie Goering was pregnant and caring for infants. Once Meta overheard Grandma Anna complain to her son Jonas about too many children. "Well," said Jonas, "which one do you think we shouldn't have had?" Meta was eleven years old by the time Emil was born. She remembered that Emil was first one for whom she had major child care responsibilities. A large family meant a lot of sharing. Once in grade school Meta won a candy bar for memorizing an entire poem, "Out of the rain to shelter himself . . . ." Rather than eating the candy bar herself, she took it home to share with the family, because they always divided special treats so everyone could have some. But this time the candy bar was melted by the time she got home; her generosity produced a mess rather than something sweet for everyone. With so much work to be done in the house and garden, Meta never became involved in farm work with horses and machinery in the fields. It seemed there always were enough men and boys around to do the men's work. But the women's sphere in the 1920's and 1930's did include work with animals around the farmstead--feeding chickens and gathering eggs; milking cows, separating the cream, and feeding the calves; slopping the pigs; doing all the special tasks assigned to women on butchering day; and all the work in the garden. Meta learned to milk cows in the milk barn before Jonas had built stanchions which held the cows in place all in a row. Normally there were between five to ten cows to milk. Meta, like all her siblings, at first learned to milk the mildest cow whose milk came easiest. But it could be a challenge sitting on a T-stool in the manure covered ground floor beside a nervous cow whose wet and dirty tail flapped the milker's face. The Goering family thrived on milk, cream, and cheese that could not pass modern inspection standards. Each day had its own routine. Monday was always wash day. 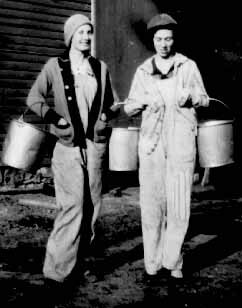 In Meta's earliest years they used a hand-operated washer and, of course, hung the clothes to dry out of doors. Tuesday was the day for ironing and patching. Katie was a good seamstress who made not only pants and dresses but also underwear for her children. When she was in high school, Meta made cotton dresses and exchanged patterns with her friends. Every day was bread-baking day except Saturdays, when they baked pies and cinnamon rolls.. The family consumed huge amounts of home-made bread. On Saturday they always ate "Borscht," a Swiss-Volhynian special soup with red beets, pinto beans, potatoes, onions, and sour cream. Saturday also was the day for boiling small potatoes in their jackets, to be served as hash browns with sauerkraut for the company that was sure to come for the noon meal after church. Last updated 13 August 2008.